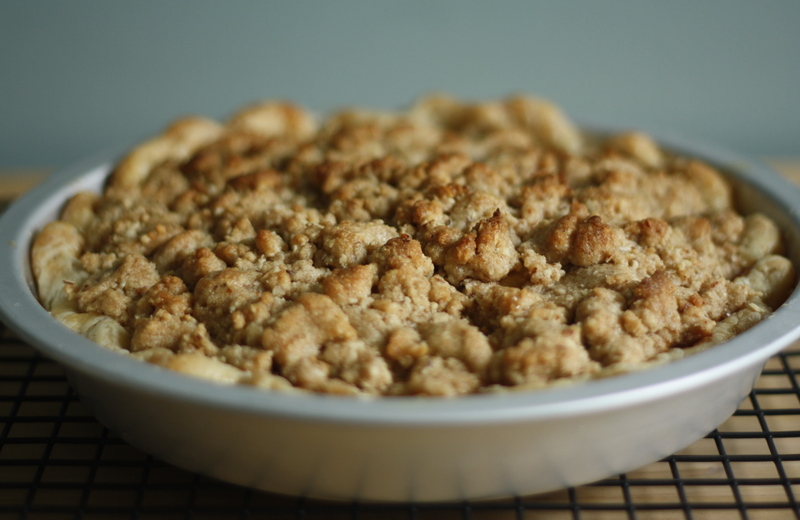 You didn’t think that I would leave you hanging after that little pie crust tutorial, did you? I LOVE making pie. For serious. Making the crust, and the rolling, and the whole idea of warm pie fresh out of the oven – it is one of my most favorite things to bake in my tiny kitchen. I have a secret though. I feel a little indifferent to the whole eating it part. I would much rather have a crumble or a crisp. 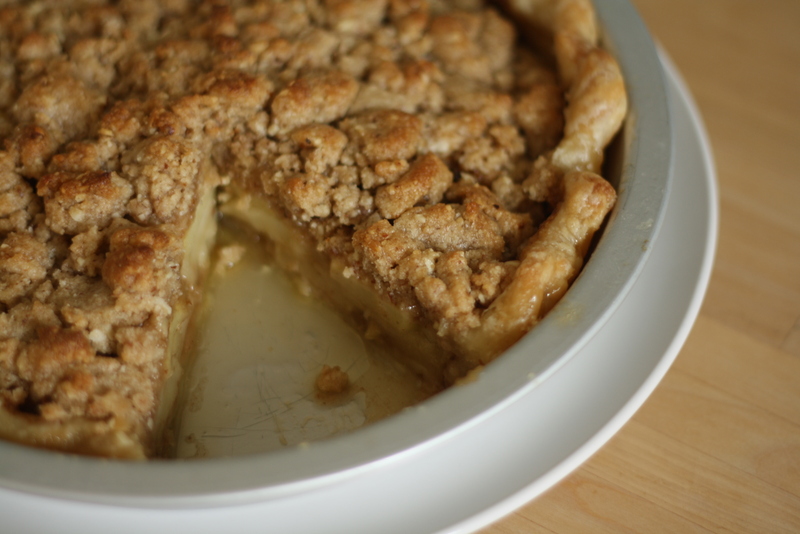 I would drive by slice after slice of pie to park in front of a plate of apple crisp. Life is strange, I know. I also have a small love affair with bourbon. Brown butter too for that matter (what is the amount of acceptable hyperlinks in one sentence?!). This is all a long winded way of saying that I found the pie of my dreams. 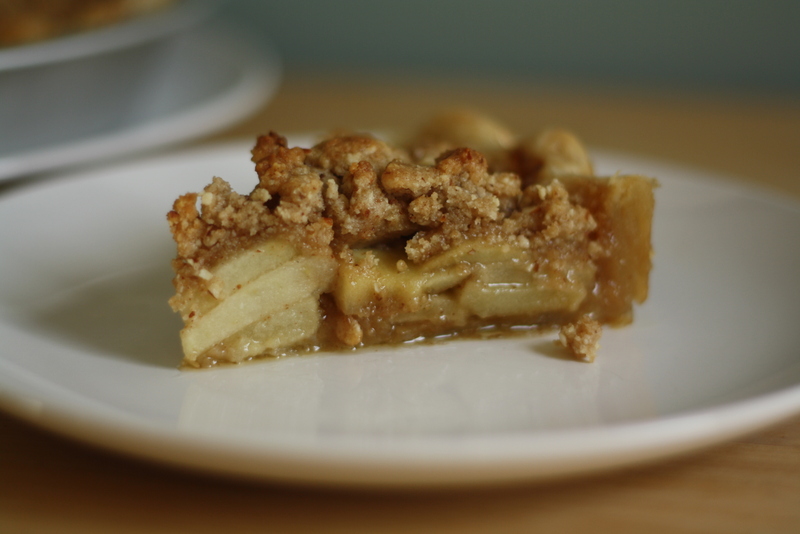 The crust is just the vehicle for the sweet and nutty crumble, rich brown butter and bourbon coat the slightly tart apples and the whole thing bakes into pure pie heaven. Make the crust: Roll out your pie dough, press it into a 9-inch pie plate, and trim the edges. 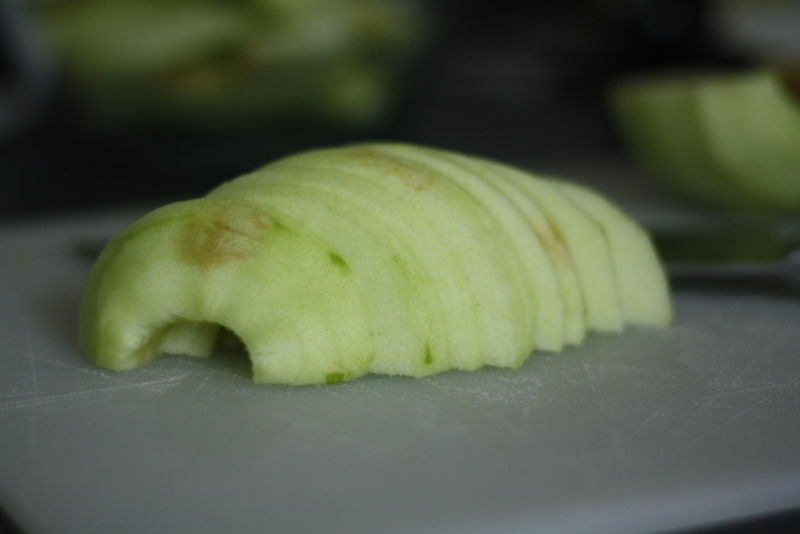 Fold over the extra dough, crimp to make a pretty edge, and prick all over with the tines of a fork. Freeze the prepared pie crust for at least 30 minutes or several hours. When you are ready to bake preheat the oven to 425 and line the frozen crust with lightly buttered foil. 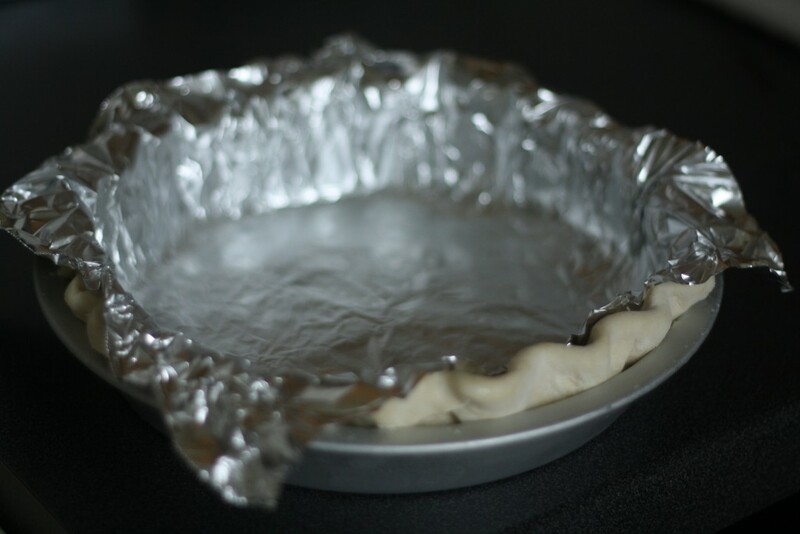 Really press the foil flush with the crust and add your pie weights. Note: I usually freeze the crust for at least 2 hours, line it with foil and then bake it with out pie weights. Why no weights? I’ve found that if you’ve pressed the foil really tight and like to live on the edge you can do with out the weights. I insist on being a renegade baker! Bake for about 25 minutes or until the crust is light golden brown. Remove foil and set aside. If you are going to bake the pie right away then increase the oven to 450. Prepare the crumble: In the bowl of a food prosessor, pluse together all the crumble ingredients except for the butter and the almonds. 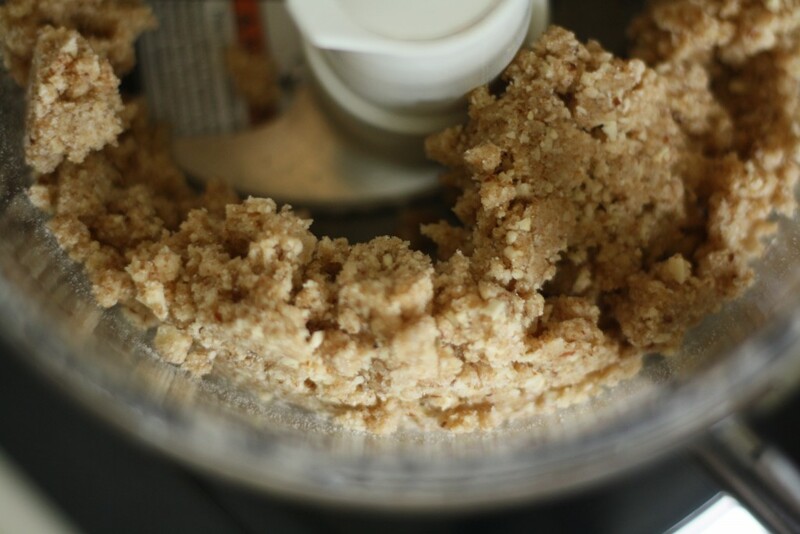 Scatter over the butter and the almonds and process until large clumps form and it begins to hold together. Chill the mixture in the fridge while you make the filling. 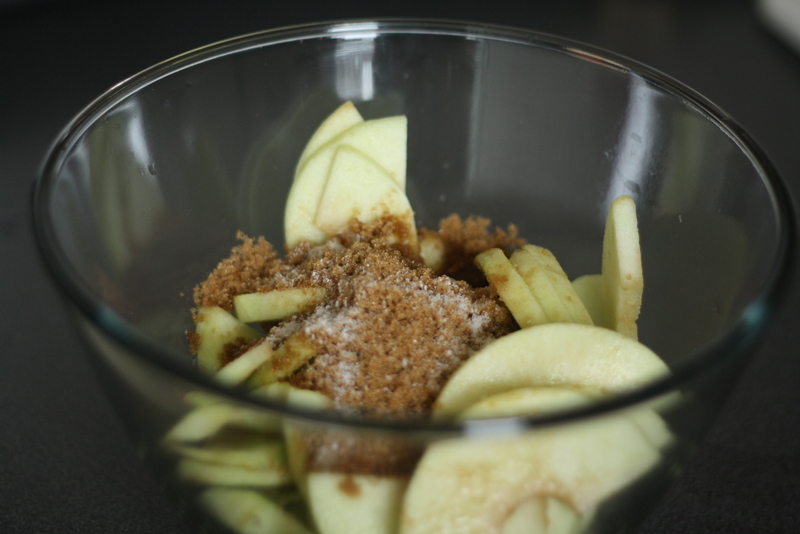 Make the filling: Combine the apples, lemon juice, brown sugar, salt, and bourbon in a large bowl. Stir until the apples are well coated. Add the brown butter and mix well. 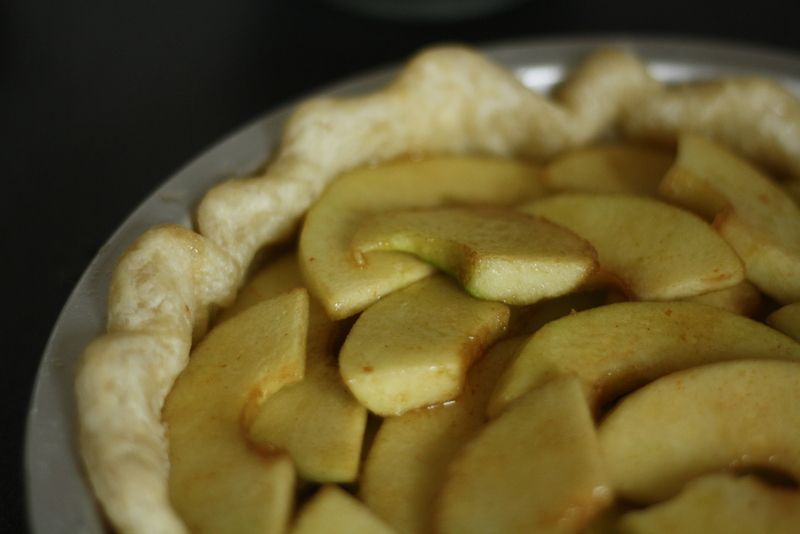 Assemble the pie: Layer the apples in concentric circles into the pre-baked pie crust. If any of the brown-butter-brown-sugar-bourbon syrup (omg! heaven!) 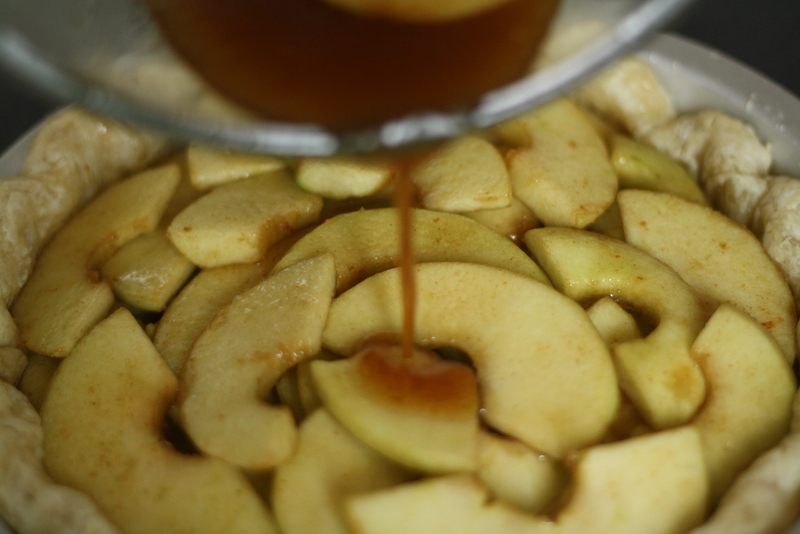 is still hangin’ out in the bowl – pour it over the apples. Sprinkle the crumble evenly over the pie. Place on a foil-lined baking sheet and bake in a 450 oven for 10 minutes. Lower the oven tempature to 350, and bake for another 30 minutes. Cool on a wire rack for about 30 minutes or until the juices set. This just took me to such a happy place! Really really love this blog. Wow! I just made this pie (it’s baking right now) and the booze/lemon/brown butter sauce in the apples is the most amazing sauce ever! I can’t wait to eat the pie! Thank you for the fabulous recipe!! Ps. love your super-clean site design. I made this for a few friends today, absolutely delicious! 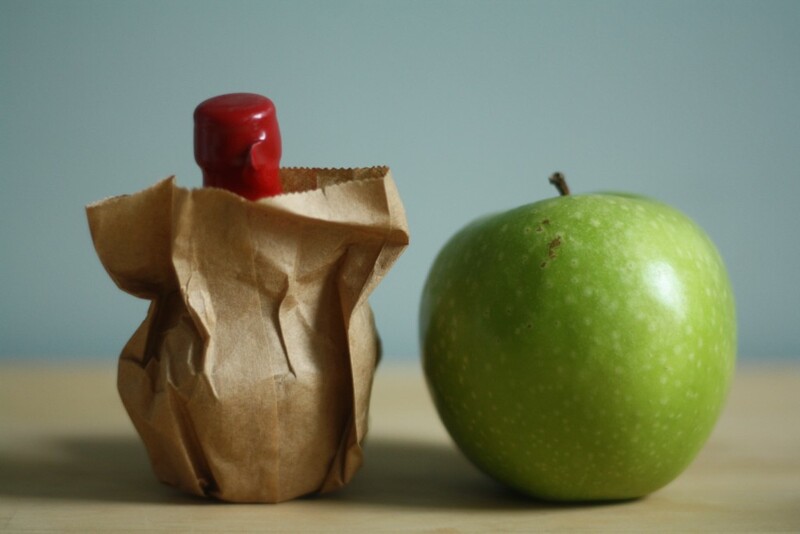 I used Jack Daniels (all I had) and Braeburn apples. I also made a warm vanilla custard to go with it. They loved it, I loved it – success! Yay!! So happy to hear it was a success!